Bedding Information: 1 King. 1 Queen. 2 Twins. 2 Full size futons. 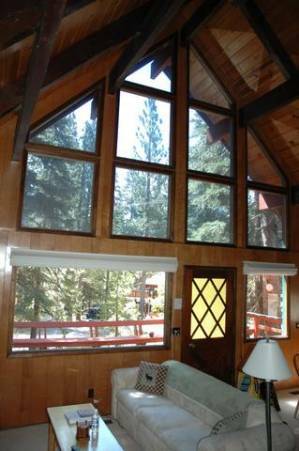 This is the perfect chalet for your dream tahoe experience. 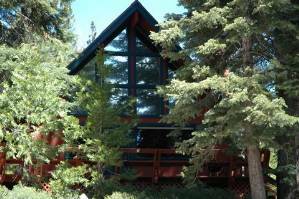 It's conveniently located a few blocks from the lake, and 10 minutes to NorthStar, and 15 minutes to Squaw and Alpine Meadows. Walk to the nearby trailhead for hiking or mt.biking. It's also 10 minutes to the stateline for some gambling excitement (if you dare...!). Clean and charming in a quiet neighborhood, with nice little luxuries including down blankets. Large kitchen for the gourmet cooks. Our spacious deck has a huge stainless steel gas grill (always a hit with the men). Big enough parking space to accomodate 5 cars, or a boat, or a snowmobile...! Easy wide road access, with a flat parking lot, so you're safe during the snow season. 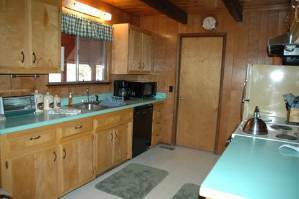 Close to nice restaurants, shops, golf course, miniature golf, and more. - Loft (1 full futon used as a couch or bed). 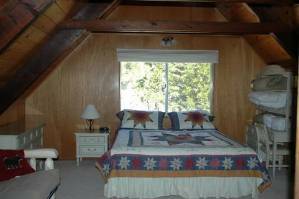 Your friends and family will have cozy Tahoe memories staying at our very special chalet. Dinnerware and silverware enough for 12 (for your friendly get togethers). Two comfortable sofas, and 2 full size futons (can be used to sleep 2 each). Games, videos, books available. Minutes To skiing & gambling. Quiet neighborhood. Cozy Chalet nestled in the quiet woods. Our master bedroom suite has its own private bathroom and television. 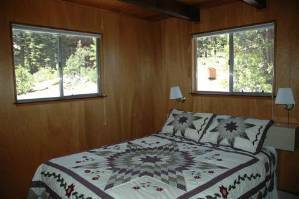 All our beds come dressed with down blankets and handmade quilts. Perfect room for the kids. 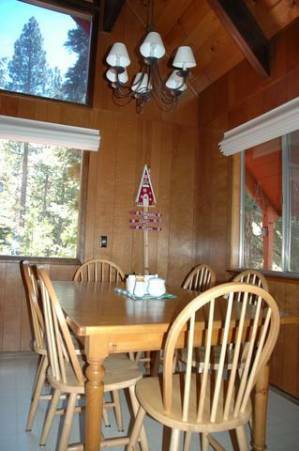 Our kitchen comes with all the supplies and place setting for a gourmet meal. We also have a huge stainless steel gas grill on our deck (very popular with the men). Amazing sunlight in the morning. 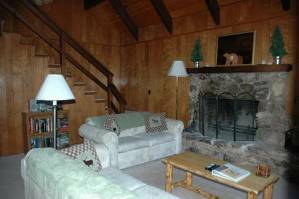 Cuddle up to our wood burning fireplace. Our family was very pleased with our stay at this chalet. It was very clean and the location was perfect. We had a great time and are planning another stay soon! 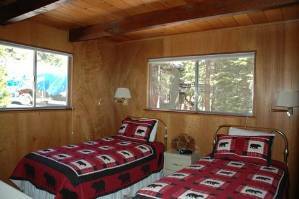 "It was the cleanest cutest cabin we've ever seen"
"We had a wonderful time at the cabin and would love to stay in touch"
"My guests,family, and I enjoyed staying in your chalet. It was very cozy." "We had a great time at your chalet - we really enjoyed it. " 10% off on mid-week rentals (Tues-Thurs nights) for Fall, Winter and Spring (holidays excluded). One night free for one week (6 nights) or longer rentals. 25% discount off nightly rate for monthly rentals. Please inquire for additional information. Deposit: $200 - refunded if propery is maintained in original condition. Cancellations and Refunds: 7 day cancellation policy.